Something akin to an Istanbul on the Volga, Kazan has successfully combined tradition and modernity. Since the Millennium Jubilee Kazan has become a very different city compared to what it used to be. It came out of the celebration of its first millennium as a completely transformed urban center staking its claim as Russia’s third capital after Moscow and St. Petersburg. Almost all pre-existing sport facilities in Kazan were rebuilt for the World University Games, while 30 new ones were built from scratch including the Water Sports Palace, the Tennis Academy, the Ak Bars Wrestling Palace, the St. Petersburg Volleyball Center, the boat canal on the Middle Kaban Lake and the 45,000-seat Kazan Arena. It is the third-largest stadium in Russia. Apart from the arrival of new sport facilities, many other changes have taken place. The entire city center has been restored and has seen the construction of a business district, a university campus, a high-speed tram and a metro. Historical monuments have been rehabilitated, while new streets and parking lots have been built. Kazan has also become a bike-friendly city, with a bike rental program featuring Paris bicycles (the first 30 minutes are free). Free Wi-Fi is available in the Metro and throughout the center. A new railway station and an additional airport terminal have been built to handle the growing inflow of tourists and sportspeople. To go to the airport visitors can take the Lastochka express train, which goes from the center to the terminal in 20 minutes, cutting the journey time in half. Tatarstan’s capital now stands out as one of Russia’s top urban destinations. 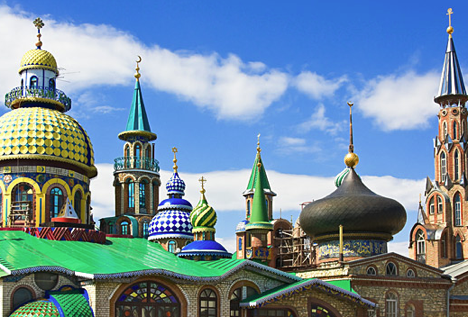 Let’s have a look at Kazan’s top seven new sights. There was a white mosque with blue domes and several minarets before Ivan the Terrible’s conquest of Kazan in 1552 in the area of the Kremlin. At the time it was the capital of the Kazan Khanate. Four and a half centuries later the authorities decided to rebuild it. The opening of the mosque took place on June 24, 2005 in honor of Kazan’s Millennium Jubilee. Since then it has become the new symbol of the city and the republic. The mosque has a capacity of 1,500 and the square in front of it can host up to 10,000 people. The shapes on its dome recall the “Kazan Cap,” which was the Khan’s crown. According to legend it was taken to Moscow after the fall of Kazan and is now located in the Armory Chamber in the Kremlin. Kul-Sharif is not just a religious space, but also hosts two exhibitions: the Museum of Islamic Culture in the Volga Region and the Museum of Ancient Calligraphy. In 1994 architect Ildar Khanov began construction of the so-called Temple of All Religions on land that he owned. In the eclectic silhouette of this cascade of buildings you can see a combination of Christian crosses, Muslim crescents, stars of David and Chinese domes. The Temple does not function as a place of worship, but features a museum, an art gallery and a concert hall. Khanov decided to erect this curious building after his travels to Tibet and India where he studied Eastern art, Buddhism, yoga and Tibetan and Chinese medicine. He was helped in the realization of this grandiose project both by local businesspeople and like-minded locals. This humanist and artist passed away in 2013 without having managed to complete the construction of the temple, but funds are being collected to complete it. This remarkable palace was built in the 21st-century and is the new seat of the Ministry of Agriculture. The entire structure was completed in two years at a cost of one billion rubles (approximately $15,000,000). The Palace of Agriculture is impressive for its magnificent simplicity and grandiosity, characteristics typical of Baroque buildings, a style that dominated European art from the end of the 16th to the mid-17th century. You will know you have arrived when you see the fanciful and enormous tree mural in the center of the structure. An enchanting and spacious park with blue and gold entrance gates was built in a previously unused area of the center following the Millennium Jubilee. The fountain in this park recalls the legend of Kazan’s founding: it is made from a “kazan” (which means “cauldron” in Russian and Tatar) guarded by some small winged drakes called “zilant.” According to legend, the city was founded at the location where a buried cauldron had begun to boil. Millennium Park is a great escape from the hustle and bustle of urban life without having to leave the city. The Kazan Family Centre is a massive structure that has become one of the most interesting symbols of the city’s renewal. It is a wedding palace built in the shape of a huge cauldron suspended on a burning hearth in which the city life is “seething.” The building was thought up by Buryat sculptor Dashi Namdakov. One hundred weddings can take place simultaneously in the three halls of the complex. The design imitates the epoch of the Great Volga Bulgars, the Kazan Khanate and even Classicism. There are separate chambers for the bridegroom and the bride, halls for banquets and celebrations and is visited by tourists and prospective families alike. It is popular for featuring one of the best viewpoints in the city. There is a two-storey viewpoint on the roof at a height of 32 meters (entrance ticket costs 50 rubles or less than one dollar). The landscaped lawns and sky above Kazan provide a wonderful background for a wedding picture or a selfie. Kazan was awarded an international prize for organizing and hosting the 2013 World University Games, acquiring the status of “world capital of sport” along with London and Dubai. Since then the city has been considered a top destination for hosting big competitions. The World University Games Village, built in 2010, is now used as a student campus. It is the most modern one in Russia. Today innumerable sport facilities are available not only to professional sportspeople, but also to tourists and to local people: besides watching competitions and using the various facilities, you can just enjoy the latter as urban sights and book an excursion by van or by minibus (from 4,000 to 16,000 rubles for a 4-hour tour, see http://kazan-citytour.ru/obzornaya_po_kazani_obiekty_universiady. The Millennium Bridge is the city’s longest bridge (1,524 metres). It unites the two sides of the Kazanka River. Its opening was the most longed-for event for the city’s and even the republic’s car drivers; moreover, the bridge became an important part of the Kazan’s Small Ring. It instantly became one of the city’s most recognizable symbols. It looks particularly beautiful in the evening, when the additional lighting is turned on and the letter M in the middle of the bridge becomes one of the most illuminated objects of the city by night.